Please refer to our stock # 1306 when inquiring. Rare Antique Korean Hat Box. 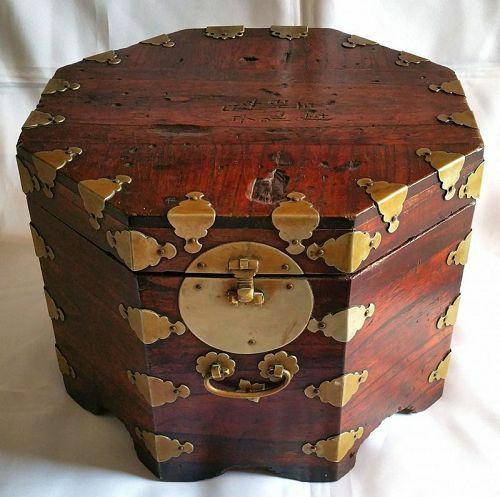 Joseon Dynasty hat boxes are so rare, that this is the only one we have ever had. This is a fine and beautifully constructed example. The original owner inscribed his name into the lid of the box, a very nice touch that adds to the collectability of the piece. It is unlikely that you will ever again see an authentic Joseon Era Korean hat box offered for sale. 11.5 x 11.5 x 8.5 inches, 29 x 29 x 21.5 cm.